Carrots are an essential staple of almost any kitchen. They are available year-round, though their season varies across the United States. The difference in taste between a carrot that has been freshly picked or sold at a farmer’s market with its leafy top still attached and that of a specimen bought at a supermarket is enormous. There are many varieties of carrots; some of them range in color from a pale off-white reminiscent of icicles to a tawny yellow with hints of green at the stem end when peeled. 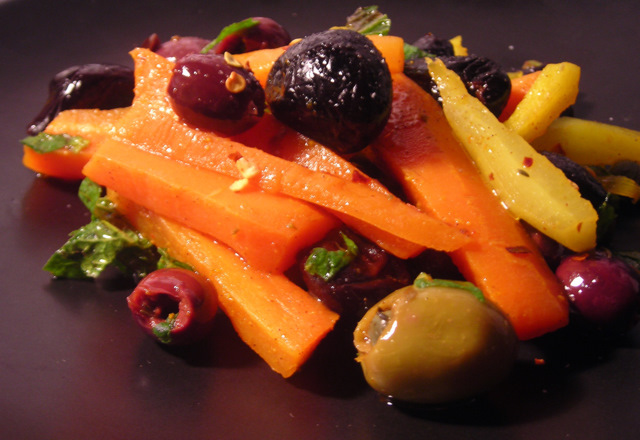 Here, sweet, tender-crisp carrots contrast beautifully with briny olives, capers and pungent mint. Bring two cups of lightly salted water to a boil. Add carrots and cook until carrots are crisp-tender, about 5 minutes. Drain, then immediately plunge into bowl of ice water to halt the cooking. Drain and set aside. Combine rice wine vinegar, cayenne pepper and cumin in a small bowl. Pour over the carrots. Marinate for 2-3 hours in the refrigerator, or preferably overnight. Just prior to serving, whisk lemon juice, mint and extra-virgin olive oil together. Taste for salt. Add a scant pinch of red pepper chile flakes to the vinaigrette, if using. Add olives and capers to the carrot mixture. Spoon vinaigrette over; toss to lightly coat vegetables, then serve immediately. Time: 10 minutes, not including prep. This is my submission for Weekend Herb Blogging #282, currently hosted by Astrid of Paulchen’s Foodblog?! and organized by Haalo of Cook Almost Anything. Weekend Herb Blogging is a weekly foodblogging event that was originally begun by Kalyn of Kalyn’s Kitchen. 05 May	This entry was published on May 5, 2011 at 12:01 am. It’s filed under cooking, food, general, spring, vegan, vegetarian and tagged capers, carrots, olives, salad, vegetarian. Bookmark the permalink. Follow any comments here with the RSS feed for this post. Pingback: Weekend Herb Blogging #282 – The Round Up • Blog Archive • Paulchens FoodBlog? !